With a base price of $50,500, the S5 is in the thick of the luxury performance car market. If you have that kind of money to spend, your choices are many and include models like the BMW 335i coupe, with its exemplary twin-turbo six-cylinder engine, and the Mercedes-Benz CLK550 luxury coupe. In spring 2008 you'll be able to add the BMW M3 to the upper end of the list of cars in this range. 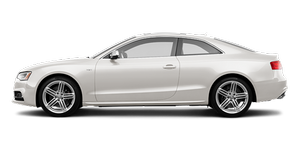 If you want to sell cars in this kind of company, you have to find a way to distinguish your product from the competition, and Audi manages to do that with the S5 in more ways than one. With its knockout V-8, curvaceous styling and upper-echelon cabin quality, the only question left is this: Where do I sign?